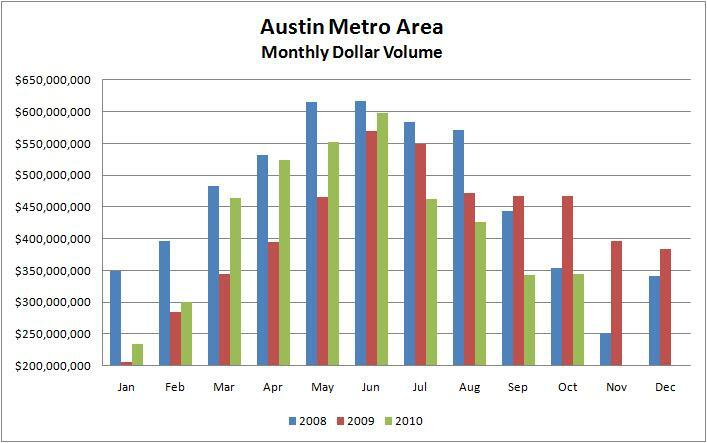 Real estate market activity remains volatile and unpredictable, nationally and in Austin. Over the past week I have commented on significant month-to-month changes in average home prices (see Home prices decline, but … and Case-Shiller caution — national index, local business). 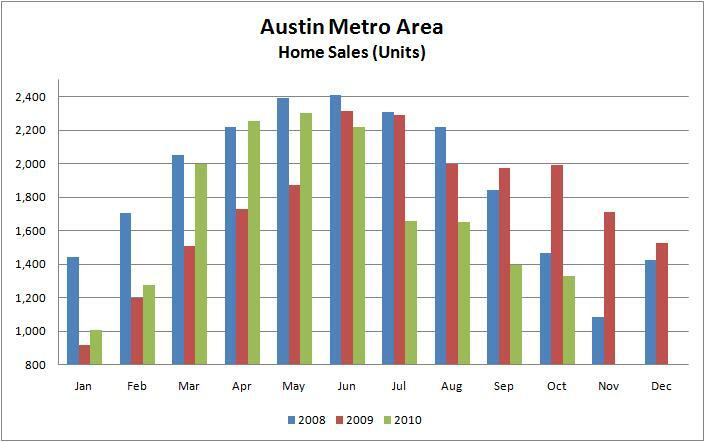 I have also noted that monthly unit sales have declined in recent months. In an effort to bring these discussions together, I have assembled several charts that I hope are helpful. That chart is not an indication of a general change in prices, but instead shows a change in the distribution of sales among various price ranges. The tax credit programs motivated buyers of lower priced homes much more than buyers at the upper end of the market, so after the expiration of each of those tax credit programs sales of lower priced homes dropped off and upper end sales drove market averages upward. Now, it’s clear that 2009 and 2010 have both been weaker than 2008, at the beginning of the recession but note, too, that for three quarters of 2010 YTD unit sales were equal to or higher than the same time one year earlier. Again, note that sales in October and November 2009 were influenced by a tax credit for homebuyers who closed by the end of November. In 2010, on the other hand, November sales dipped more like a “normal” year, so cumulative sales for the year were below 2009 for the first time. 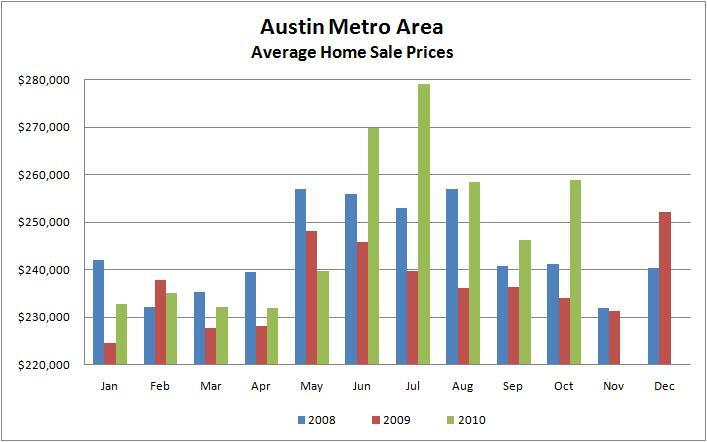 In this view you can see that the total value of homes sold in the first ten months of 2010 remains higher than 2009. You can also see the gap narrowing as the effects of the last tax credit program fall further into the past, and this year’s comparison to the November 2009 tax credit is more pronounced. Again, this year’s real estate market remains volatile and unpredictable, but if we filter out some out of the ordinary market influences from the past couple of years, 2010 doesn’t nearly as dire as some news reports make it sound. 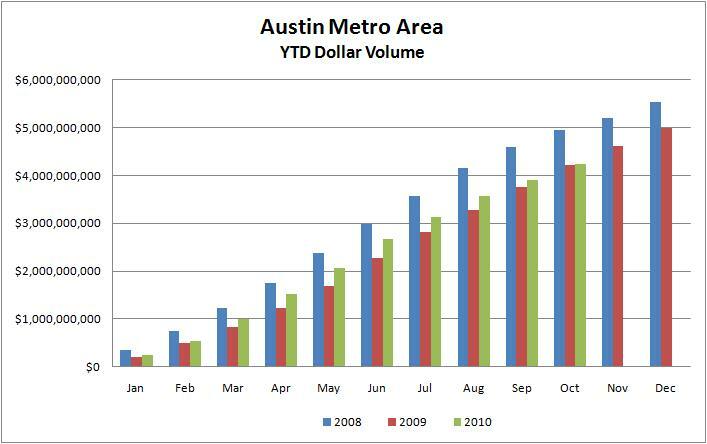 Most analysts expect a slow recovery in the U.S. market in 2011, and many reports predict the Austin/Central Texas area to lead. Only time will tell, but even in a difficult time we’re more than holding our own. 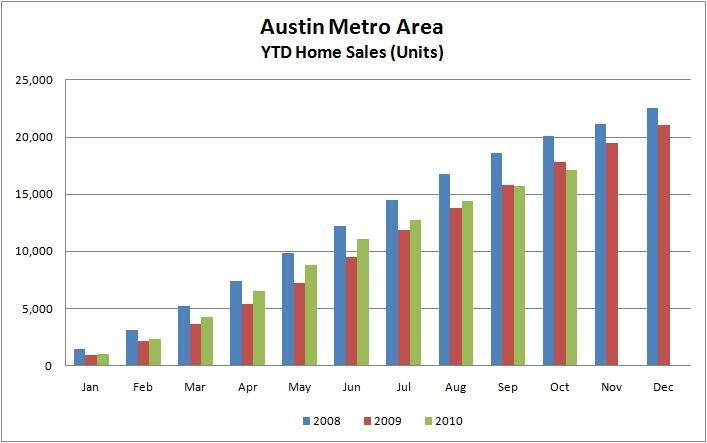 « Comparison: Foreclosure sales in Austin vs. U.S.